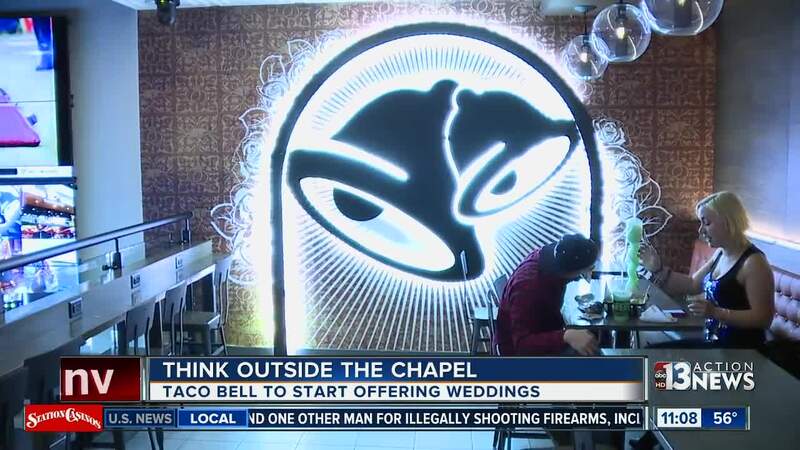 Taco Bell Cantina on the Las Vegas Strip is offering couples the chance to get married at their restaurant. Mahsa Saeidi reports. Do you love tacos? Would you like to combine your love of tacos with the love of your life? Taco Bell Cantina on the Las Vegas Strip is offering couples the chance to get married at their restaurant. The Love and Tacos Contest and Happily Ever Crashers Sweepstakes is open from Feb. 14 through 26. Those who enter must upload a 30-second video about his or her love story and use the hashtag #LoveAndTacosContest. Voting will begin on March 1 and the winner will be selected March 16. The winning couple and one friend will be flown to Las Vegas for the ceremony. In addition, winners will receive a bouquet made of hot sauce packets, a 12-pack of tacos, and champagne flutes filled with Twisted Freezes. And if you don't win, you could still get married at Taco Bell Cantina. Wedding packages will be available this summer for $600. The package includes a ceremony inside the restaurant, a reception for 15 people, a sauce packet garter and bow tie, "Just Married" T-shirts, a hot sauce packet bouquet and Taco Bell-branded champagne flutes.